Salesforce Org Analytics: how well do you understand your Org? What Org documentation do you already have? We calculate the percentage of descriptions that are filled out. Not every item in your Org can have a description, but most can. So, we think this is a good measure of the documentation of your Org - at the most basic level. 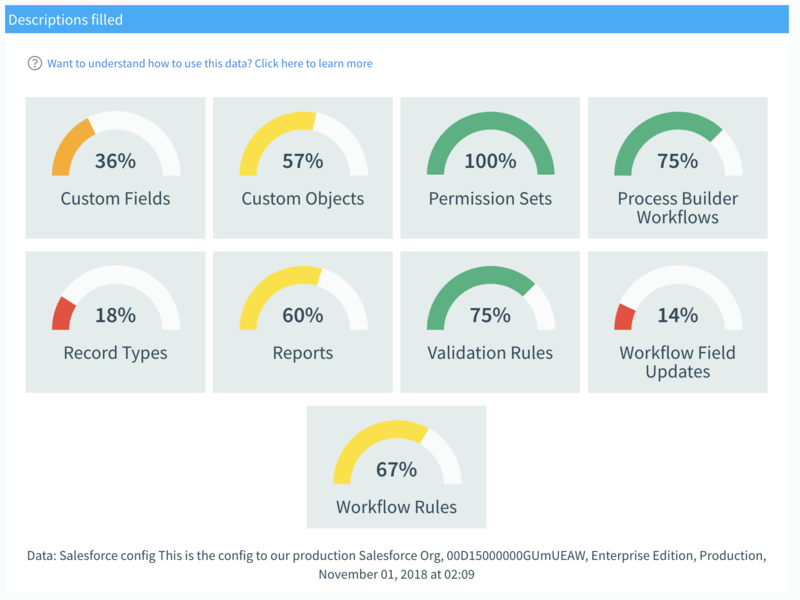 You can easily update your Object & Field descriptions in Elements (details tab in the Org Model) and the system will update the fields in Salesforce. For all fields for your custom & standard objects we look at how many fields have the help text filled in. 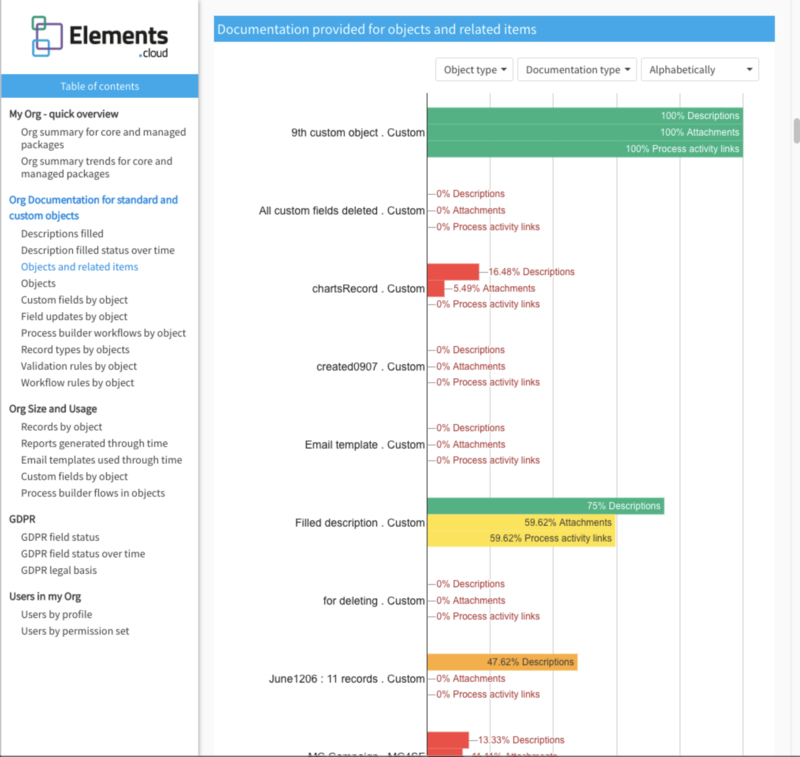 This data is presented in 2 charts: Custom fields by objects and Objects & related items. You can easily update your field help text in Elements (details tab in the Org Model) and the system will update the fields in Salesforce. We calculate the percentage of how many items in your Org are connected to process activities. Every node in your Org Model can be linked to many process activities which helps to understand when a given item should be used (and, if an item is not linked to any process, is it ever being used?) For our charts we calculate if a given item is connected to any process activity. We calculate the percentage of how many items in your Org have attachments (notes, images, URLs, data tables). Every Salesforce node can be extended with additional data which helps to understand how it is being used and evaluate its usefulness. For our charts we calculate if a given item has any attachments. For chart Documentation provided for objects and related items we calculate a weighted documentation percentage for each object and for each documentation type by adding up and applying a weighting to all the items in an object to come up with an overall percentage. For the remaining bar charts the % is calculated binarily, i.e. we check whether an item (e.g. object) or set of items (e.g. custom fields on an object) have descriptions filled, process activities linked & attachments added. How are you doing over time? This chart shows you the trends for each item and how they have changed over time. The descriptions for every item are displayed in the "DETAILS" tab in the right panel for the item and also as a subtitle in the main panel. The simplest action is to start adding descriptions for every item. It doesn't need to be more than a short summary - think Twitter, not War and Peace. Just enough so that someone quickly understands the reason for the configuration. The attachment links (notes, URL, data tables, images, requirements & process activities) in the "DOCUMENTATION" tab in the right panel are for more comprehensive documentation. These are for getting the "tribal knowledge" that is in ad-hoc documents, photos of whiteboard sessions or still in people's heads, collected and linked to the Org Model tree structure. It can be updated, refined and rewritten later - getting it linked and seeing what you have is the first step. Clicking on any bar in charts that display objects will open the Org Model on that object and you can easily start documenting that object.